Skechers stock is screaming higher after better-than-expected earnings. Here's how to trade it now. Shares of Skechers (SKX - Get Report) were flying higher on Friday, up 15.2% to $31.91 after the company's better-than-expected fourth-quarter earnings results. So how do we trade this name? I would like to see Skechers stock hold up over the $32 level, a mark that has really held this name in check since April of last year. Further, when looking at the 52-week range, the 50% retracement from the April highs to the December lows is right near $32.40. So it's no surprise that SKX stock is struggling with this area after such a big move. It doesn't help that Sketchers stock was ~30% off its December lows going into earnings. Some profit taking should be expected at this point. 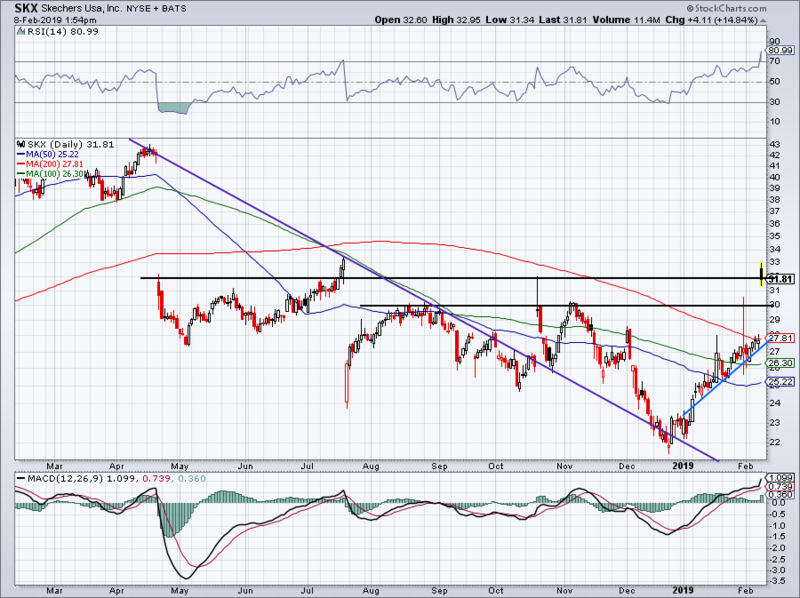 However, Skechers' price action remains encouraging with shares over $30. Below that mark and bulls may want to consider reducing their long exposure. But it wouldn't be bearish to see SKX stock consolidate between $30 and $32.50 before trying to push higher again. Should it push higher, a run to $35 gets it to the 61.8% retracement. A longer-term move back up to $42 allows Skechers stock to fill that dreadful gap it suffered in April. Should $30 fail as support and SKX stock moves lower instead, look for a retest of the 200-day moving average and/or uptrend support (blue line), whichever comes first. So what's got investors so optimistic following this report? Even though the company's quarterly sales of $1.08 billion grew 11.3% year-over-year, they missed analysts' estimates. However, the miss isn't a headline to focus on given that the results came up just $20 million short of consensus expectations. Earnings were much stronger, coming in at 31 cents per share, 40% ahead of analysts' 22 cents per share consensus expectations. It even came in ahead of the most optimistic estimates. Driving the big earnings beat was margin expansion. Gross margins of 47.7% topped analysts' expectations of 46.9% and came in 90 basis points better than the 46.8% in the same period a year ago. Operating margins told an even better tale, with margins of 7.7% topping the 5.9% consensus estimates and growing 200 basis points (up over 35%) from the 5.7% operating margins in the same period a year ago. Investors are hopeful that Skechers can maintain momentum, helping to drive bottom line results higher and with it, its stock price. Honeywell stock is rallying to new 52-week highs as earnings and guidance top expectations.